The Nike Golf – Dri-FIT Classic Tipped Polo Style 319966 is available in Adult Sizes: XS-4XL and and is available to purchase in Pinenut, Black, Dark Navy, Pacific Blue and White to make you look good on or off the golf course. 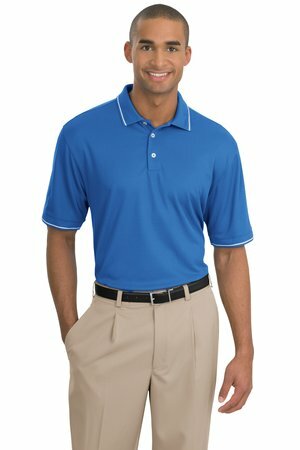 Features of the Dri-Fit Classic Tipped polo include: 4.7-ounce, 100% polyester Dri-FIT fabric for moisture management, stitch-trimmed shoulder panels and gussets, flat knit collar and cuffs, three button placket, pearlized buttons and a contrast swoosh trademark embroidered on the left sleeve. The Nike Golf – Dri-FIT Classic Tipped Polo comes in adult sizes XS-4XL and is available to purchase in Pinenut, Black, Dark Navy, Pacific Blue and White.